Huzzah! We met our Kickstarter goal today! I am beyond humbled and grateful for everyone that supported this project. And guess what? We have time to spare! Let’s see if we can go beyond our initial goal to raise money towards Beezus’ transportation costs (around $800). We can do this!!! Before the show: More running around. Spent the morning picking up odds and ends before heading to the East Bay in the afternoon to bring the car over. Getting Beezus on a Uhaul trailer was no easy task, but thanks to the genius guys at NIMBY and my super patient friends we managed to make it happen! I somehow drove Beezus and the trailer over the Bay Bridge into San Francisco without any accidents! I may have had a friend do the parking, and I might have cried a little before the drive, but I did it! At the venue: Once we made it to F8, it was setup time! We had an hour to get ready, so my friends helped me hang all of the art pieces and put up the auction bid sheets. My friend Chris took charge of setting up the food in the back. He’s brilliant. He made pulled-pork sandwiches, honey bacon cheesecake bites, and baklava. AND we had miss Leslie bring us some fantastic home made cookies! We finally got set up just in time. THE SHOW! : We had a blast! I was running all over the place, but over the course of the night we had tons of fun. We had music from GoNZoFuZe, Bedrockk, VitaminDevo, and Dj Alarm, delicious treats all night, laughter, dancing, art, and general shenanigans. We sold half of the art, had about 100 people come through, and raised over $1000 towards our lord and savior! The aftermath: We parked Beezus by the bay and went to sleep for a few hours. We came back in the morning to take him home, but lo and behold the trailer had a flat! Luckily Chris and I had just gotten coffee, so we were able to enjoy it peacefully while we waited. Eventually we were able to get him unloaded at NIMBY and made it home safe. And I slept. HARD. I am so beyond appreciative for everyone that helped. Joshua, Atlas, Jo, Chris, Leslie, Hilda, Billy, Devo, Or, Dave, Willis, Jen, Wendy, Kerri Ann, Iswari, Jon, Mike, Annie, Artie, Sam, Camille, Rafael and everyone else who made that night amazing! HOORAAAAAY! After lots of tweaking and planning, we have our Kickstarter page up! We’ve got some pretty stellar gifts lined up, including custom bandanas, art, pendants, and jars. Check it out! Share it with your friends! And donate if you can! Let’s get Beezus to the burn! 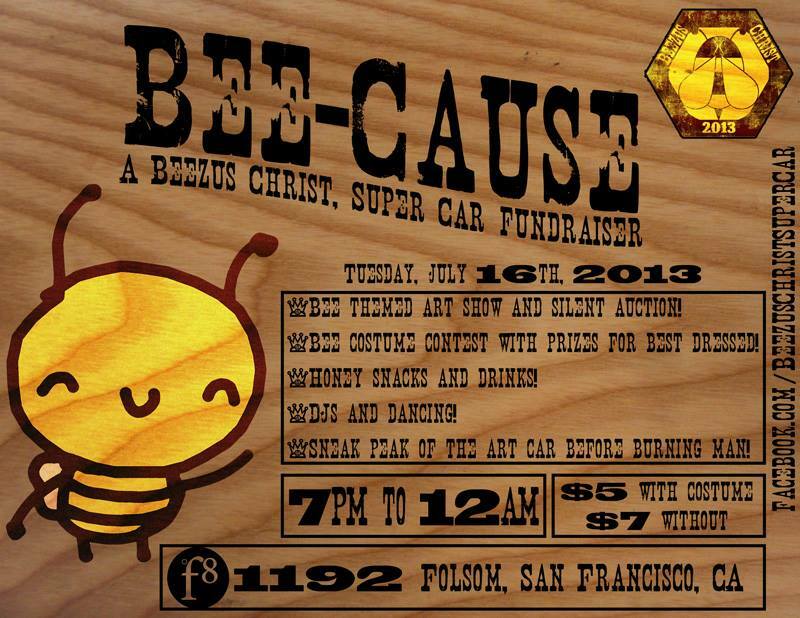 A silent auction with bee-themed art from some amazingly talented artists! A rockin’ dance party with some super-talented local DJs! So come shake your stinger and support the Bee-Cause! We’re asking for a $7 donation at the door ( or only $5 if you come in bee attire!) Let’s get weird!